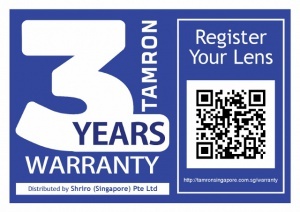 The warranty is valid for Tamron lenses purchased from our authorised dealers in Singapore. The Tamron lenses must have the above sticker on the packaging. # All online purchases from local and overseas e-commerce 0r parallel imported goods shipped from overseas will not be covered by this warranty. Please contact our general service hot-line (65) 6508 8129 for 3 years local warranty information.